Hello, glad you stopped by. Let me begin by answering the question that is undoubtedly on your mind: No, you are not dreaming. Please ask me and I would be glad to tell you all. Dating online can be an ominous thing. For those of you saying, “Bonnie looking for her Clyde,” they were horrible humans. I have decided to experience life instead of hiding myself away. Nomadic at heart, having called Chicago, LA, NYC, and a few cities in the SF Bay area home at some point in my life. I’ll be back in the states soon from a winter in Costa Rica. A new beginning that’s where I’m at, a deep breath, ah, ok. I hate these boxes. I recently learned there are 45 different styles of tacos available in my city and I’m looking for an adventuresome woman who is interested to check out a few of these with me. I just heard about this from a friend. Hello, a new experience. When I delve into something I give it my all. Bragging about oneself is not my forte. I am a fun, athletic guy who’s always interested in learning new things and meeting new people. I am driven, goal oriented and run my own business. I’m a responsible and dependable guy with a great sense of humor. One of the last good guys. Clark Kent with an edge. When I’m not sculpting scale models of Machu Picchu onto the head of a pin, I’m saving the plankton in the Great Barrier Reef and developing a serum that will rid the world of cleft palates. Combine lime juice, sesame oil, honey and soy sauce. Add cucumber and jalapeno, toss and set aside. Heat a bit of oil in an oven-proof pan. Season chicken breast with salt and pepper and sear both sides until browned. Move pan into oven and roast until internal temperature is 165 degrees. Let chicken rest and slice. Cook rice noodles as directed on the package, drain and rinse with cold water. 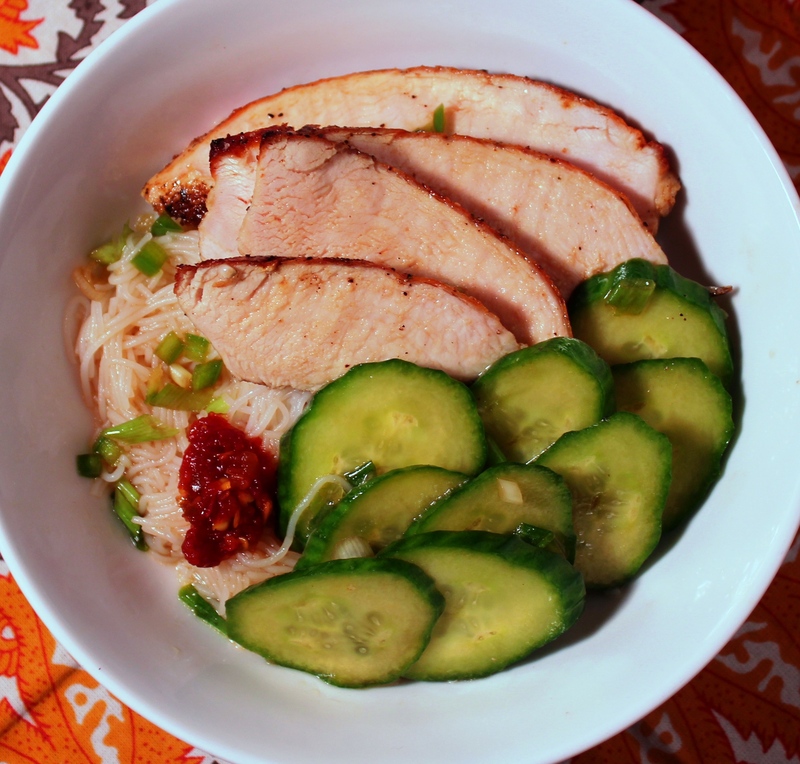 Divide the noodles, chicken and cucumbers between two plates. Drizzle with remaining cucumber dressing. Garnish with red chili paste. Today, I received my inaugural CSA basket from our local farmer Donna and spent my first hour at home this evening “breaking it down” for the remainder of the week – I’m trying for no waste/no spoilage. I made a huge salad for tomorrow’s lunch with a combination of baby spinach and spring mix and added cucumber, celery, green onions and some torn basil. To that, I added a few of my nectarines, fresh from my tree. 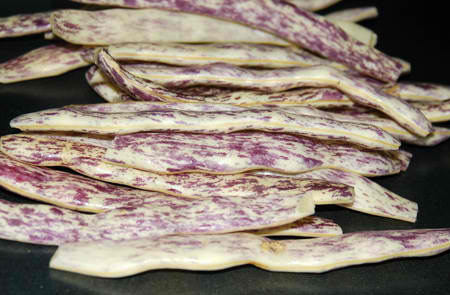 I tossed the purple beans with sesame oil, soy and a little green curry paste and oven- roasted them. The dragon beans, which seemed big and tough to me, just needed about 10-12 minutes of steaming and a sprinkling of white truffle salt. As I write this, I’m eating them chilled, dipped in white bean hummus – delish. I sliced the Swiss chard in a chiffonade and sautéed it with some chopped green onions and garlic in a little olive oil and finished it with a sprinkling of salt. My plans for the zucchini, which I’m hoping will keep for a few days, is a Greek inspired grain salad – perhaps farro, with shredded zucchini, tomatoes, feta, oil cured black olives, green onions, fresh dill, mint and squeeze of lemon juice.